Thane, February 6: Respecting the mandate of the people is important for a democracy to succeed. Vice President M. Venkaiah Naidu has said that ethical and responsible leadership was the need of the hour. He said that understanding the ground realities, interaction with common people and observing the changing aspirations of the youth were very important for people aspiring to be in public life. Embrace technology, innovation to find solutions to new challenges emerging in the modern world. Naidu was interacting with students from Indian Institute of Democratic Leadership promoted by Thane in Maharashtra based Rambhau Mhalgi Prabodhini (RMP), here today, and stressed upon the need for students perusing a career in public life to acquire a decent understanding of the role and responsibility of every institution and their importance in functioning of a democracy that has more than 130 crore population with different set of aspirations. The Member of Parliament Dr. Vinay Sahasrabuddhe and other dignitaries were present on the occasion. The Vice President said that a clean government, Clear Vision and Committed Leadership was needed to transform the lives of people. He urged upon Universities, colleges and institutions such as the Indian Institute of Democratic Leadership inculcate such qualities in students from their school days. He said that making students understand the functioning of a democratic republic and introducing them to Parliamentary system was also needed. 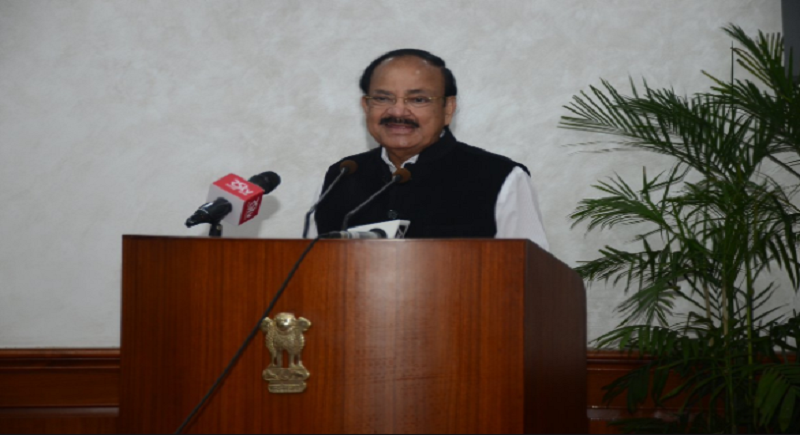 Naidu said that an aware citizenry, a vibrant and responsible civil society, a robust institutional framework and responsive bureaucracy was crucial in India’s efforts towards making it free from hunger, free of atrocities, free of inequalities and discrimination based on cast, gender, and religion. The Vice President stressed upon the need to strengthen systems that incorporate technology into our governance systems to ensure hassle-free service to the last man living in the remotest part of the country. He wanted the youth to embrace technology, innovation to find solutions to new challenges emerging in the modern world. Naidu asked the youth to have a democratic mind that is receptive to new ideas and tolerant to other views. Respecting the mandate of the people was important for democracy to succeed. One must learn to respect it, he added.